The new “head-only” stunning device which is being developed by TopKip is a legal electrical stunning method for poultry without any use of water. New recently enacted legislation (EU and NL) requires that birds are rendered completely unconscious immediately during a stunning process. Legislation also requires that the birds need to remain fully anesthetized until death has set in. The head only dry-stunning method is an excellent alternative for presently used systems because it completely fulfils the new legislative requirements.An effective threshold current is determined by each bird’s individual head resistance. The head only stunning will induce unconsciousness instantly and assures that the birds are non responsive to pain without compromising carcass quality. Excellent alternative for water bath and gas stunning. Suitable restraining during stunning, calming positioning. The bird resistance determines the proper stunning electrical current. Bird is immediately unconscious and non responsive to pain. Individual stunning, tracking and tracing. Easy to integrate in existing slaughter lines. 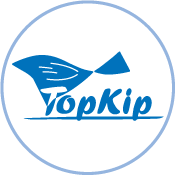 Topkip’s patented Stunning Technology is the only method in the world which meets completely strict Halal ( الحلال ) slaughter regulations this enables advanced poultry slaughter companies to broaden their scope of activities into Islamic regions.